IS OVERTIME KILLING YOUR BUDGET? | Tracking Systems, Inc.
IS OVERTIME KILLING YOUR BUDGET? When it comes to fleet management, scheduling is the key to success. Although on paper, your schedule might seem in order but unforeseen circumstances may force you to stray from that timeline which pushes your company into overtime. 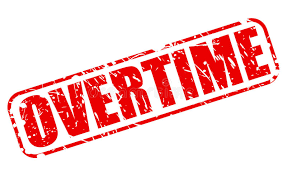 Overtime is a necessary evil occasionally but if it is affecting your bottom line, there may be an underlying issue that can be resolved. Tracking Systems’ GPS tracking can help you get to the bottom of your OT issues by helping with employee productivity, driver behavior, and stolen vehicles or property. Time wasting is a major problem, not just in fleets but in every job. According to the US Bureau of Labor, in 2016 65% of employees reported they use the internet on their phone or computer during the work day for non-work purposes. Other ways employee’s waste time is by when they first arrive at work, they may have their morning coffee, take a bathroom break, or chat with co-workers about their upcoming day or weekend. Stopping for food, gas or speaking to a customer for longer periods of time at a job site can all contribute. It may not seem like a big deal, but when you add all those minutes up, it could be a half hour or an hour before they are heading off towards their destination. By utilizing data from GPS tracking you will be able to see where an employee is losing time, making unauthorized stops or idling too long and gives you the ability to sit down and speak with your employees about how they can improve their management skills. Speeding, excessive braking, hard braking and accelerating too quickly can all contribute to accidents, emergency vehicle maintenance, and prolonged stops. The worst thing that can happen is a vehicle breaking down on the side of the road causing major maintenance bills and a vehicle out of commission. If an accident occurs, injured drivers and wrecked vehicles means the rest of your fleet has to make up for lost time and productivity. GPS tracking will allow you to monitor driver behavior, for instance, if a driver is speeding, braking too hard or excelling to quickly, you will be able to take control of the situation by speaking with the drivers. A driver who knows they are being monitored may also drive more carefully preventing potential accidents and unforeseen vehicle mishaps. Total loss of a vehicle will not only cause a major headache but it will affect your entire fleet and timeline. If a customer’s goods are in the truck, it could cause an even bigger issue. With GPS tracking, you will not only be able to locate the vehicle, but you will also be able to have sensors monitor doors, windows, and even the ignition. Door sensors will alert you when a door is opened or closed. Seat sensors will alert you if someone is seated in the passenger or back seats. Power Take Off (PTO) informs you when the PTO is triggered. With these features, you won’t have to worry about the “what ifs…” you will be able to monitor and have detailed reports about your entire fleet and drivers. Tracking Systems wants to help fleet managers and the companies they work to increase productivity, reduce costs & improve customer service through smarter route optimization. If you would like more information about Tracking Systems’ features and amazing support, give us a call at 845-738-2200 or visit our website at www.track-sys.com.